The Next thing is configuring the SMS gateway. The first thing to configure is the SMS Gateways. You can configure all the 4 available SMS gateways at once. But can use only one at a time. And you have to choose the activate gateway from the switcher. 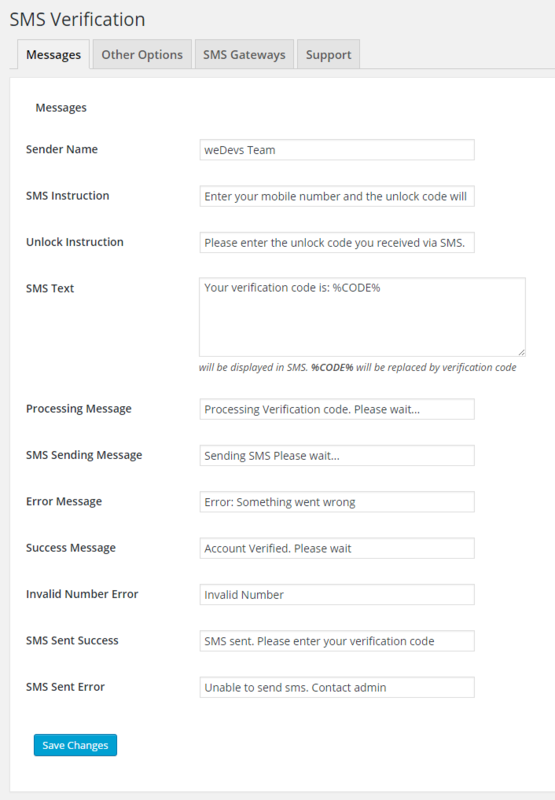 The page to configure the SMS gateways can be found at wp-admin → Settings → SMS Verification → SMS Gateways. These fields are self-explanatory. So nothing much to describe here. 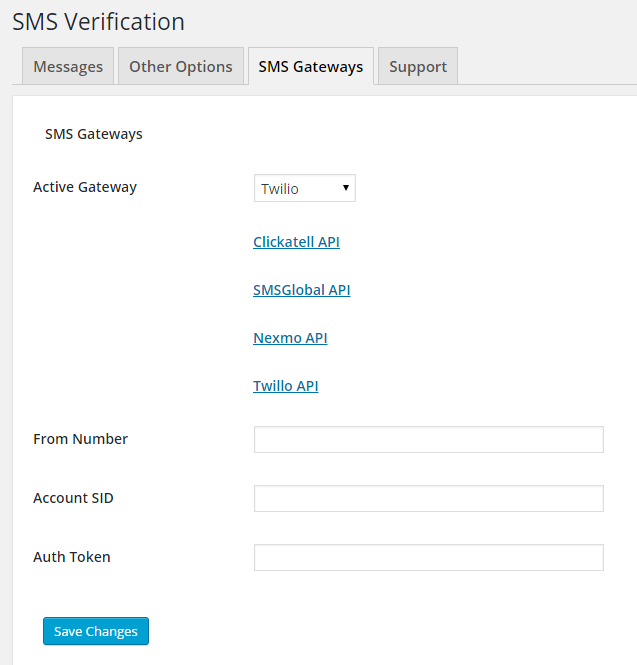 If you have bought any bulk SMS package from any of the mentioned SMS gateways, they will provide you the API details to use your own software system. You can also contact their support to get the API details. When you are done with placing the API details, move on to the Messages tab. You will find all the messages coming from this plugin including the strings that will go in the SMS and show in the browser to the user. The fields found here are self-explanatory and the default texts works fine for most of the users. But you can always customize them as you like. These fields will reduce the hassle of translating the plugin for your users. Next is the options to select where the plugin will work and where not. Most of the time your blogs comment section is attacked by spammers and no firewall and security plugin can not save you from them. That is why we introduced the user verification in comment form. Till now, none of our users have complained about spamming after activating this option. And the most exciting things is you can get the mobile number of the users of your blog readers from your gateway provider and use them later for your products and promotion. Turning this on helps you to verify your users while they sign up. So if you have this option enabled from the beginning of your site, and your commenting feature is only enabled for registered users only, then you are not going to need to verify the users in the comment form. This will reduce your servers some milliseconds for each user to check and verify. 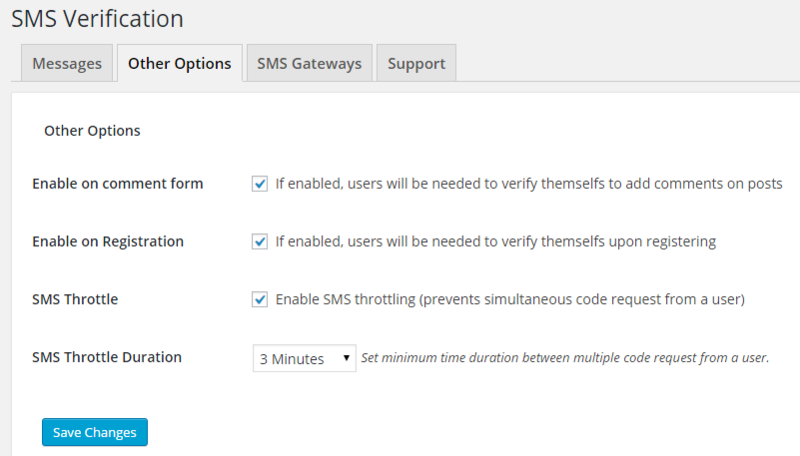 SMS Throttle and Duration These two are the most important features of this plugin. We know that SMS does not come free and each time a user requests for a verification code, you lose money. So we have made a feature to limit how much requests can be sent depending on time period. So this feature makes it more efficient and we got you covered with all the possible features you need.